According to ny.curbed.com, nearly 90% of bike collisions occur at intersections. The Department of Transportation (DOT) is on a mission to change that with unique designs and revised guidelines for developing intersections. One of the most important places to institute these changes is in New York City, where there are over 1,000 miles of bike lanes that traverse through the city. Every year since 2015, at least 50 more miles of bike lanes have been added to the list. DOT’s ultimate goal is to reduce fatalities to zero – known as their Vison Zero goal. While they have already improved safety considerably, they still have a way to go. How Many Cyclists Are Injured Each Year? As of 2017, just under 4,400 cyclists were reported as injured in a car crash, and 25 were killed. The majority of these injuries occur at intersections. A big issue contributing to death and injury is that large trucks often block bike lanes, forcing cyclists to move out into traffic. Not to mention, protected bike lanes are crucial to protecting cyclists. Unfortunately, community boards often fail to see their importance and oppose their development. 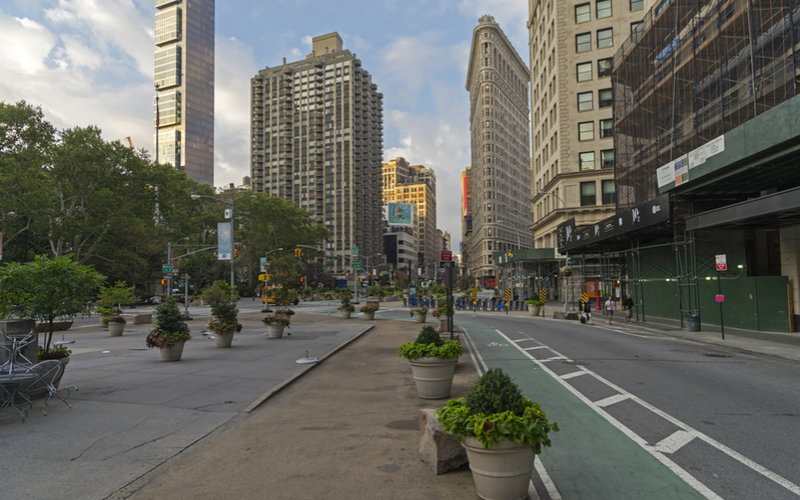 In late 2018, DOT released a study titled “Cycling at Crossroads: The Design Future of New York City Intersections.” The study introduces new design guidelines that would reduce accidents and even save lives. “[A]s overall traffic fatalities have declined and cycling has increased within New York City under Vision Zero, the number of cyclists lost in fatal crashes has remained stubbornly and tragically high, with deaths actually increasing over the last several years,” writes DOT commissioner Polly Trottenberg in the intro of the study. Since the majority of these injuries and fatalities occur in intersections, it is painfully clear that something needs to be done. DOT’s study focused on four distinct types of intersections on one-way streets with protective infrastructure (such as parked cars, bollards, etc.) in place. The “Mixing Zone” intersection is one of the types they observed. This type of intersection involves bikes and automobiles sharing the same turning space. The bike lane merges with the auto lane ahead of the turn. This design was shown to reduce crashes by 27 percent. The “Fully Split Phase” does not combine the two lanes into one. Instead, it offers different lanes and traffic signals for bikes and automobiles. This design is even better, reducing accidents by 54 percent. The study also included two new design ideas for intersections. The first of which is the “Offset Crossing,” also known as a protected intersection. This design was inspired by Dutch cycling infrastructure and physically divides turning autos and bikes using flexible bollards, crossing islands, and distinct paint on the pavement. The other original design they looked at is known as a “Delayed Turn” intersection. This design involves sharing a Mixing-Zone lane, although cyclists are given a head start at the turn thanks to a signal that turns green for bikes a few moments before it turns green for automobiles. The study found that the safest measures implemented were Mixing Zone and Fully Split Phase intersections. These two designs helped reduce accidents the most. At the same time, they identified that Delayed Turn and Offset Crossing intersections improve cyclist confidence and reduce accidents between bikes and vehicles, as well as limit right of way confusion. “Not everybody bikes, drives, or walks in the same way, so each street needs a context-specific solution,” said DOT spokesperson Brian Zumhagen. That means each street must be considered for its unique characteristics to find the best solution possible. While many cities are in the process of developing safer bike lanes, New York is the first city to closely examine how the different intersections work – codifying and scaling them around the city. Outfitted with the knowledge from this study, the plan for the future includes updating Mixing Zone intersections with shorter zones, while implementing additional left-turn traffic calming measures. In addition, they will update signals for better bicycle flow, and add more distinct markings to intersection pavement. Adding more protected bike lanes is another crucial piece of the puzzle. With thousands of intersections throughout NYC, it will take some time to improve safety across the city. In the short term, there are plans to update 20 key intersections. According to experts, protected barriers need to cause some damage to vehicles or else drivers often disregard them and will simply run them over – thus, defeating their purpose. At TerraCast Products we are proud to be a part of the solution. We offer durable bollards that make excellent barriers against traffic. Shop our collection of bollards made here in the USA.